The Touro Synagogue, dedicated in 1763, is the oldest synagogue in the United States and the only one that survives from the colonial era. The congregation was founded in 1658 by Sephardic Jews, descendents of the Marranos who fled the Inquisition in Spain and Portugal, and who were themselves fleeing the persecution they had experienced in the Caribbean. At first they were unable to build a synagogue and so they held their religious services and school in private homes or rented buildings. Members of the community began to pass away, however, and so in 1677 the congregation purchased some land for a cemetery. 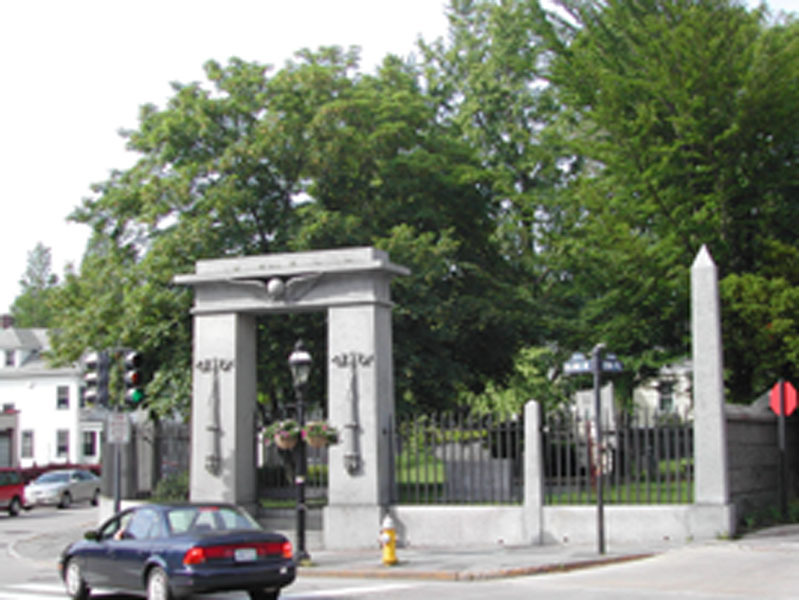 During their first century in Rhode Island, members the congregation became successful merchants and craftspersons, and their numbers grew with the immigration of more Sephardim as well as Ashkenazim (Central and Eastern European Jews) who joined the community and adopted the Sephardic tradition. The enlarged community found that it needed a permanent place of worship, and so they turned to their coreligionists elsewhere for help in financing the building of a synagogue. A generous response came from New York City’s Congregation Shearith Israel (the only congregation to preceed the Newport congregation in what is now the United States) and from other congregations in Jamaica, Curacao, Surinam, and London. Peter Harrison, America’s most famous 18th-century architect volunteered to design the building, which took four years to construct and was dedicated December 2, 1763 by the congregation’s rabbi, Isaac Touro. The dedication was attended by many non-Jewish notables from Newport and surrounding areas. It is considered among Harrison’s greatest works, which also include King’s Chapel in Boston and Christ Church in Cambridge, MA. With their new synagogue and previously-acquired cemetery, the congregation could now perform the three essential functions of Jewish communal life: worship and holiday observances, religious education for children, and burials for the dead. The congregation chose the name Yeshuat Israel (“Salvation of Israel”). 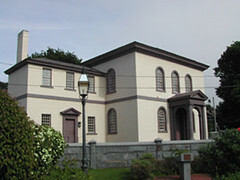 During the War for American Independence, Newport’s vitality declined and for some time the synagogue was closed. 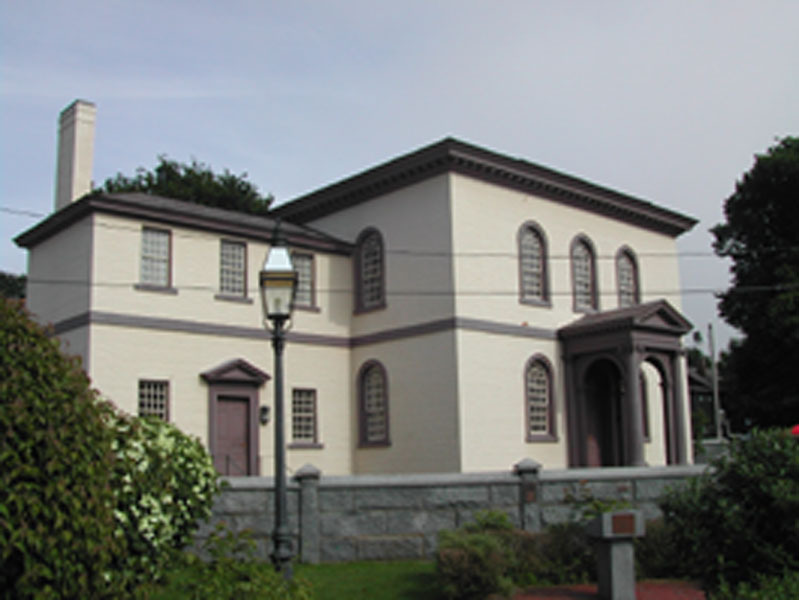 But after the war the community revived, and because many of the city’s other buildings had been damaged, the synagogue was used for both religious purposes and public ones, including meetings of the Rhode Island General Assembly and the Rhode Island Supreme Court. In 1790, President Washington visited the synagogue and several days later wrote to the congregation, proclaiming that “…the Government of the United States…gives to bigotry no sanction, to persecution no assistance…”, over a year before the adoption of the Bill of Rights which then applied only to the federal government. A few years later the community declined again, and the title to the synagogue passed into the hands of New York’s Congregation Shearith Israel. But the two sons of Rabbi Isaac Touro at their deaths bequeathed money for the synagogue’s restoration and for the salary of its rabbi. 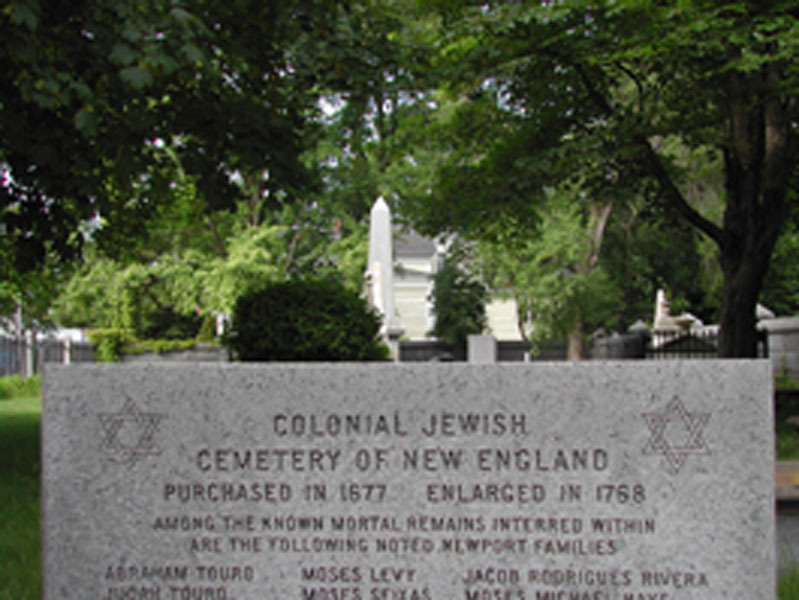 Still, the synagogue was not permanently reopened until 1833 when new immigration brought more Jews to Newport. These newcomers continued to follow the Sephardic tradition. The synagogue’s architecture is Georgian and uses the classical motifs of symmetry, balance, and ordered rhythm formalized by the ancient Romans. As was the custom of Sephardic Jews, the synagogue was inconspicuously located on a quiet street. It stands diagonally on its small plot so that worshippers standing in prayer before the Ark face eastward toward Jerusalem. The exterior is rigidly plain brick but the interior is abundantly furnished. Twelve Ionic columns, representing the twelve tribes of Israel, support its gallery. Above these twelve Corinthian columns support its domed ceiling. In keeping with Orthodox Jewish tradition, women sit in the gallery and men sit below. Five massive brass candleabora hang from the ceiling. The Eternal Light, a symbol of divine presence, hangs before the Ark and was presented to the congregation in 1765. Above the Ark is a representation of the Ten Commandments in Hebrew, and in the center of the room is the bimah, an elevated platform where the cantor intones the liturgy and reads from the Torah. Below the bimah is a trap door, symbolic of the early community’s fears of persecution. The burial ground is a short walk up the street. 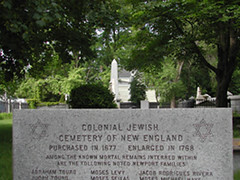 It inspired Longfellow’s poem, “The Jewish Cemetery at Newport.” The Tuoro Synagogue was dedicated a National Historic Site in 1946 and it continues to serve at the place of worship for Congregation Jeshuat Israel.